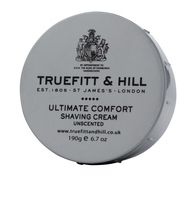 Truefitts’ Ultimate Comfort Range is specially formulated for gentlemen with sensitive skin. Ultimate Comfort Shaving Cream is designed to provide the closest shave while at the same time protecting and aiding in the repair of the shaver’s skin. Lavender essential oil is a gentle antiseptic which helps to heal skin, while moisturizing glycerin improves glide and comfort ensuring that this cream forms a thick, rich lather. Ultimate Comfort is part of our unscented range, so contains no additional scent.